At Inter Engineering experienced engineers are available at any time to answer any technical question and to provide professional support for the fast solving of problems. The technical support department is excellently equipped and maintains a continuously open communication channel with the product manufacturers as well as with colleagues all over the world with whom invaluable knowledge is shared. Our technical support infrastructure is an integrated part of the solutions that we provide. All members of the Inter Engineering technical support team are engineers with specialized education and years of experience in the IT and Data Security field. They have been trained and continue to be trained on the Inter Engineering solutions but also on Data Security issues more general. They speak at least two languages and are characterized by excellent cooperation skills as well as performance in any kind of circumstances. Also under heavy pressure. The Inter Engineering technical support has every kind of equipment that it could possibly need such as a complete lab with independent network and state of the art computers for any kind of test or customer environment simulation, virtualization tools and specially developed software tools for the facilitation and acceleration of the work. The support department’s organization guarantees the smooth and speedy flow of servicing and the completion of every case. It contains a ticketing system for the automatic monitoring of the cases and the issuing of warnings in case the development of a case is not conform the Inter Engineering high quality criteria. Naturally all support cases are treated with absolute discretion. The solutions sold by Inter Engineering either consist of a software license subscription which includes maintenance and support, or software licenses with a separate subscription for maintenance and support. All end customers who have paid their maintenance and support subscription are entitled to Inter Engineering Standard Support Services, for the period of that subscription. This Standard support covers the needs for troubleshooting when a solution is not functioning as it should and is delivered through phone and email. 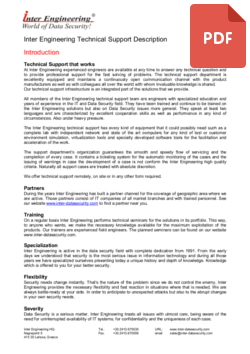 Click on the image to download the full description of our support services. This is the subscription to Inter Engineering’s elite support, exploiting our technical support capacities to the maximum. It consists of a number of very useful extra support services. Actually the ACSS services are the result of customer and partner requests we received over the years. We have turned the satisfaction of these requests into a package called ACSS. Since its inception in 2009 the ACSS Services are extremely popular. The ACSS subscription is offered at a very small extra cost, which earns itself back in no time. 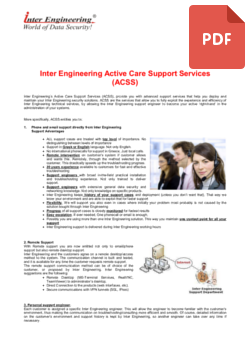 Click on the image to download the full description of our Active Care Support Services.